دهمرده قلعه نو, محمد, ماستری فراهانی, محمد رضا, مدهوشی, محراب, رسولی, داود, شاکری, علی رضا, قاسمی, اسماعیل. (1396). تأثیر هوازدگی بر خواص سطح چند سازه های چوب- پلی اتیلن با دانسیته بالا. مجله صنایع چوب و کاغذ ایران, 8(4), 483-496. محمد دهمرده قلعه نو; محمد رضا ماستری فراهانی; محراب مدهوشی; داود رسولی; علی رضا شاکری; اسماعیل قاسمی. "تأثیر هوازدگی بر خواص سطح چند سازه های چوب- پلی اتیلن با دانسیته بالا". مجله صنایع چوب و کاغذ ایران, 8, 4, 1396, 483-496. دهمرده قلعه نو, محمد, ماستری فراهانی, محمد رضا, مدهوشی, محراب, رسولی, داود, شاکری, علی رضا, قاسمی, اسماعیل. (1396). 'تأثیر هوازدگی بر خواص سطح چند سازه های چوب- پلی اتیلن با دانسیته بالا', مجله صنایع چوب و کاغذ ایران, 8(4), pp. 483-496. دهمرده قلعه نو, محمد, ماستری فراهانی, محمد رضا, مدهوشی, محراب, رسولی, داود, شاکری, علی رضا, قاسمی, اسماعیل. تأثیر هوازدگی بر خواص سطح چند سازه های چوب- پلی اتیلن با دانسیته بالا. مجله صنایع چوب و کاغذ ایران, 1396; 8(4): 483-496. در این مطالعه، تأثیر هوازدگی بر خواص سطح چند سازه های چوب- پلی اتیلن با دانسیته بالا بررسی شد. عوامل متغیر شامل میزان ماده نانو دی اکسید تیتانیوم (0، 1، 2 و 3 درصد)، نوع ماده اولیه (چوب تیمار حرارتی شده و چوب بدون تیمار) و تثبیت کننده نوری (0 و 1 درصد) بودند. شاخص روشنایی (L*) و تغییر رنگ (∆E) در زمان های 0، 500، 1000 و 1500 ساعت بررسی گردیدند. تغییرات شیمیایی و تخریب سطحی که در نتیجه هوازدگی بوجود آمدند نیز با استفاده از طیف سنجی تبدیل فوریه مادون قرمز (FTIR) و میکروسکوپ الکترونی (SEM) قبل و بعد از 1500 ساعت هوازدگی آنالیز شدند. طیف سنجی تبدیل فوریه مادون قرمز (FTIR) چند سازه های چوب پلاستیک نشان داد که بعد از هوازدگی، شاخص کربونیل افزایش و شاخص چوب کاهش پیدا کرد. میکروسکوپ الکترونی (SEM) نیز نشان داد که نمونه های هوازده شده دچار تخریب سطحی شده اند. چند سازه های چوب پلاستیک حاوی نانو ذرات دی اکسید تیتانیوم، ترموود (چوب تیمار حرارتی شده) و تینوین 328 (تثبیت کننده نوری)، ترک های سطحی کمتری بعد از هوازدگی در مقایسه با نمونه شاهد از خود نشان دادند. تغییرات شاخص کربونیل و شاخص چوب نمونه های حاوی نانو ذرات دی اکسید تیتانیوم، ترموود و تینوین 328، بعد از هوازدگی در مقایسه با نمونه شاهد کاهش پیدا کرد. نتایج همچنین نشان داد که شاخص روشنایی و تغییر رنگ نمونه ها بعد از هوازدگی افزایش پیدا کرد. با استفاده از نانو دی اکسید تیتانیوم، ترموود و تینوین 328، ثبات رنگ چند سازه های چوب پلاستیک بهبود بخشیده شد. Turku, I. and Karki, T., 2014. Research progress in wood-plastic nanocomposites: A review. Journal of Thermoplastic Composite Materials, 27(2):180-204. Bledzki, A.K., Reihmane, S. and Gassan, J., 1998. Thermoplastics reinforced with wood fillers: a literature review. Polymer-Plastics Technology and Engineering, 37:451-468. Craig, C., 2002. Wood-plastic Composites in the United States. Journal of Forest Products, 52(6):10-18. Lu, J.Z. and Duan, X., 2008. Chelating efficiency and thermal, mechanical and decay resistance performances of chitosan copper complex in wood polymer composites. Bioresource Technology, 99(13):5906-5914. Turku, I. and Karki, T., 2016. Accelerated weathering of fire-retarded wood–polypropylene composites. Composites, 81:305-312. Stark, N.M., Matuana, L.M. and Clemons, C.M., 2004. Effect of processing method on surface and weathering characteristics of wood-flour/HDPE composites. Journal of Applied Polymer Science, 93(3):1021-1030. Bajwa, D.S., Bajwa, S.G. and Holt, G.A., 2015. Impact of biofibers and coupling agents on the weathering characteristics of composites. Polymer Degradation and Stability 120:212-219. Gugnmus, F., 1990. Light stabilizers, plastics additives handbook, chapter 3:129-262, Gachter, R. and Muller, H., Hanser Publishers, New York. Kord, B. and Kord, B., 2016. Influence of type and content of chemical foaming agent on the dynamic mechanical properties of high density polyethylene-flax fiber composites. Iranian Journal of wood and paper industries, 7(2):179-191. (In Persian). Taib, R.M., Zauzi, N.S.A., Ishak, Z.A.M. and Rozman, H.D., 2010. Effects of photo-stabilizers on the properties of recycled high-density polyethylene (HDPE)/Wood Flour (WF) composites exposed to natural weathering. Malaysian Polymer Journal, 5(2):193-203. Muasher, M., Sain, M., 2006. The efficacy of photostabilizers on the color change of wood filled plastic composites. Polymer Degradation and Stability, 91(5):1156-1165. Rasouli, D., Faezipour, M., Masteri Farahani, M.R. and Tajvidi, M., 2013. The effect of zinc borate and additives on weathering performance of wood-high density polyethylene composite. Journal of Wood and Forest Science and Technology, 20(2):41-58. Deka, K.P. and Maji, T.K. 2011. Effect of TiO2 and nanoclay on the properties of wood polymer nanocomposite. Composites, 42:2117–2125. Hayle, S.T. and Gonfa. G.G, 2014. Synthesis and characterization of titanium oxide nanomaterials using sol-gel method. American Journal of Nanoscience and Nanotechnology, 2(1):1-7. Filpo, G.D., Palermo, A.M. and Rachiele, F., 2013. Preventing fungal growth in wood by titanium dioxide nanoparticles. International Biodeterioration & Biodegradation, 85:217-222. Huang, X., Kocaefe, D., Kocaefe, Y., Boluk, Y. and Pichette, A., 2012. Study of the degradation behavior of heat-treated jack pine (Pinus banksiana) under artificial sunlight irradiation. Polymer Degradation Stability, 97:1197-1214. Yang T.C., Noguchi, T., Isshiki, M. and Wu, J.H., 2015. Effect of titanium dioxide particles on the surface morphology and the mechanical properties of PVC composites during QUV accelerated weathering. Polymer Composites. Published online in Wiley Online Library (wileyonlinelibrary.com). 2015 Society of Plastics Engineers. Butylina,S., Martikka, O. and Karki T., 2015. Weathering properties of coextruded polypropylenebased composites containing inorganic pigments. Polymer Degradation and Stability, 120:10-16. Olarescu, M.C., Campean, M., Ispas, M. and Cosereanu, C., 2014. Effect of thermal treatment on some properties of lime wood. European Journal of Wood and Wood Products, 72:559-562. Ayrilmis, N., Jarusombuti, S., Fueangvivat, V. and Bauchongko, P., 2011. Effect of thermal-treatment of woodfibres on properties of flat-pressed wood plastic composites. Polymer Degradation and Stability, 96:818-822. 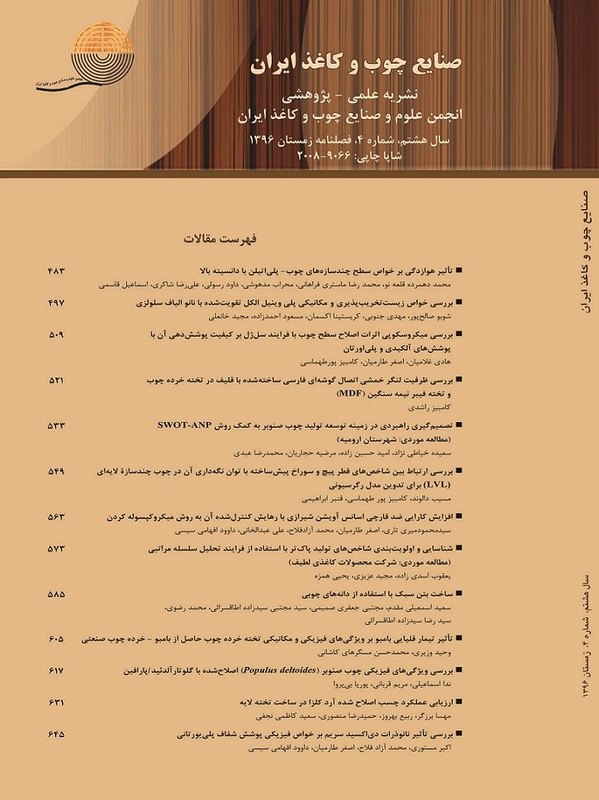 Arwinfar, F., Hosseinihashemi,S.K., Jahan Latibari,A., Lashgari, A. and Ayrilmis, N., 2016. Mechanical properties and morphology of wood plastic composites produced with thermally treated beech wood. BioResources, 11(1):1494-1504. Kallakas, H., Martin, M., Goljandin, D., Poltimae, T., Krumme, A. and Kers, J., 2016. Mechanical and physical properties of modified wood flour reinforced polypropylene composites. Agronomy Research, 14(S1):994-1003. Tomak, E.D., Ustaomer, D., Yildiz, S. and Pesman, E., 2014. Changes in surface and mechanical properties of heat treated wood during natural weathering. Measurement, 53:30-39. Standard practice for operating fluorescent light apparatus for UV exposure of nonmetallic materials. American Society for Testing and Materials, West Conshohocken, ASTM G154 -06, 2006. Standard practice for calculation of color tolerances and color differences from instrumentally measured color coordinates. American Society for Testing and Materials, West Conshohocken, ASTM D 2244-09a, 2009. Stark, N.M. and Matuana, L.M., 2007. Characterization of weathered wood-plastic composite surfaces using FTIR spectroscopy, contact angle, and XPS. Polymer Degradation and Stability, 92:1883-1890. Peng, Y., Liu, R., Cao, J. and Chen Y., 2014. Effects of UV weathering on surface properties of polypropylene composites reinforced with wood flour, lignin and cellulose. Applied Surface Science, 317:385-392. Stark, N.M. and Matuana, L.M., 2006. Influence of photostabilizers on wood flour-HDPE composites exposed to xenon-arc radiation with and without water spray. Polymer Degradation and Stability, 91(12):3048-3056. Fabiyi, J.S., McDonald, A.G., Wolcott, M.P. and Griffiths, P.R., 2008. Wood plastic composites weathering: Visual appearance and chemical changes. Polymer Degradation and Stability, 93:1405-1414. Stark, N.M., 2006. Effect of weathering cycle and manufacturing method on performance of wood flour and high-density polyethylene composites. Journal of Applied Polymer Science, 100:3131-3140. Stark, N.M. and Matuana, L.M., 2004. Surface chemistry changes of weathered HDPE/wood-flour composites studied by XPS and FTIR spectroscopy. Polymer Degradation and Stability, 86:1-9. Yang, T.C., Noguchi, T., Isshiki, M. and Wu, J.H., 2014. Effect of titanium dioxide on chemical and molecular changes in PVC sidings during QUV accelerated weathering. Polymer Degradation and Stability, 104:33-39. Gugumus, F., 2002. Possibilities and limits of syngergism with light stabilizers in polyolefins 2. UV absorbers in polyolefins. Polymer degradation and stability, 75(2):309-320. Chanda, M. and Roy, S.K., 2010. Plastics fundamentals, properties and testing. Vol. 74, CRC press, 280p. Li, H., Zhang, Z., Song, K., Lee, S., Chun, S.J., Zhou, D. and WU, Q., 2014. Effect of durability treatment on ultraviolet resistance, strength, and surface wettability of wood plastic composite. BioResources, 9(2):3591-3601. Ayadi, N., Lejeune, F., Charrier, F., Charrier, B. and Merlin, A., 2003. Color stability of heat-treated wood during artificial weathering, Holz als Roh-und Werkstoff, 61:221-226. Deka, M., Humar, M., Rep, G., Kricej, B., Sentjurc, M.and Petric, M., 2008. Effects of UV light irradiation on color stability of thermally modified, copper ethanolamine treated and non-modified wood: EPR and DRIFT spectroscopic studies. Wood Science and Technology, 42:5-20. Nuopponen, M.,Wikberg, H., Vuorinen, T., Maunu, S.L., Jamsa, S. and Viitaniemi, P., 2004. Heat treated softwood exposed to weathering. Journal of Applied Polymer Science, 91:2128–2134. Kocaefe, D., Poncsak, S. and Boluk, Y., 2008. Effect of thermal treatment on the chemical composition and mechanical properties of birch and aspen. BioResources. 3(2):517-537. Krehula, L.k., Katancic, Z., Sirocic, A.P. and Hrnjak-Murgic, Z., 2014. Weathering of high- density polyethylene-wood plastic composites. Journal of Wood Chemistry and Technology, 34:39-54. Hung, K.C., Chen, Y.L. and Wu, J.H., 2012. Natural weathering properties of acetylated bamboo plastic composites. Polymer Degradation and Stability, 97:1680-1685. Kiguchi, M., Kataoka, Y., Matsunaga, H., Yamamoto, K. and Evans, P.D., 2007. Surface deterioration of wood-flour polypropylene composites by weathering trials. Journal of Wood Science, 53:234-238. Rajakumar, K., Sarasvathy, V., Chelvan, A.T., Chitra, R. and Vijayakumar, C.T., 2012. Effect of iron carboxylates on the photodegradability of polypropylene. II. Artificial weathering studies, Journal of Applied Polymer Science, 123:2968-2976.